As the nation's experts on oceanic and atmospheric science and the lead science agency for coastal oil spills, the Office of Response and Restoration (OR&R) was on the scene of the Deepwater Horizon oil spill from the earliest moments of the crisis in April 2010. Our scientists used data from satellites, aircraft, ships, buoys, and gliders to collect and provide mission-critical information to guide the emergency response to the spill, as well as the long-term assessment and restoration of the Gulf Coast. Peruse an overview of the case, as well as some of our news updates during the spill, or, reference the following websites for historical information and the most up-to-date resources on OR&R and NOAA activities related to the Deepwater Horizon oil spill. OR&R Deepwater Horizon Trajectory Maps: A record of the Deepwater Horizon spill trajectories, generated by OR&R from April 21 through August 23, 2010. The trajectory maps predict how an oil spill will spread and move within a local area and are available on this site by type and by date. Environmental Response Management Application® Deepwater Gulf Response: is OR&R's online mapping tool integrating key environmental response information for first responders and decision makers. ERMA integrates both static and real-time data, such as Environmental Sensitivity Index (ESI) maps, ship locations, weather, and ocean currents, in a centralized, easy-to-use format. This site served a critical role in the response to the Deepwater Horizon oil spill and remains a valuable reference. The Environmental Response Management Application exists for all regions of the United States. ERMA aids in spill preparedness and planning, assists in coordinating emergency response efforts and situational awareness for human and natural disasters, and supports the Natural Resource Damage Assessment (NRDA) process. DIVER and the DIVER Explorer Tool: Data Integration Visualization Exploration and Reporting (DIVER) allows users to search and download a broad array of environmental characterization and project planning data specific to geographic regions or activities. Specific data for the Deepwater Horizon oil spill has been integrated into the comprehensive DIVER website. The DIVER Explorer Tool is an OR&R application for the integration and distribution of natural resource assessment related response, assessment, and restoration data, as well as historical data collected from hazardous sites around the country. The public can access these data using the DIVER Explorer query tool, which allows users to search, filter, and download data. For those targeting specific NRDA cases or activities, you can quickly locate data using the DIVER Explorer query links highlighted on the home page. For those interested in a more general data discovery, click on the DIVER Explorer region to start your exploration. NOAA National Centers for Environmental Information (NCEI): is the archive for oceanographic data collected during the oil spill. The archive provides access to physical, chemical, and biological oceanographic datasets available for download. NOAA Studies Documenting the Environmental Impacts of the Deepwater Horizon Oil Spill: Directly access and download publications produced from OR&R’s natural resources damage assessment. As caretakers of the critical resources damaged by the spill, the states and federal trustees, including our scientific colleagues at universities and institutions around the Gulf, engaged in a rigorous, scientific process of natural resource injury assessment. This site compiles the published results of NOAA's efforts that appear in peer-reviewed scientific journals. The studies were paid for partly or entirely by NRDA funding. Archives of certain samples collected during the damage assessment. After completion of the DWH damage assessment in 2016, NOAA published notices offering samples collected during the assessment to the broader research community. In addition, NOAA created an archive of the thousands of samples of plankton and other water column biota collected. Samples from dolphins and other marine mammals were added to the NOAA Marine Mammal Tissue Bank. NOAA distributed most of the DWH (Macondo) oil and Corexit dispersant obtained for study during the spill to numerous researchers who responded to our notices in 2016. NOAA retains a small amount of Macondo oil and Corexit dispersant for potential uses in the future. For inquiries into DWH oil or dispersant: Oil from the Macondo Prospect (MC252) is loosely classified as a type A –Louisiana light sweet crude oil. The Corexit formulations used during the DWH response are manufactured by NALCO Environmental Solutions LLC. OR&R Photos on Flickr. 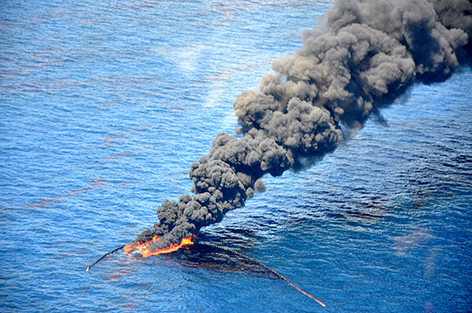 Use the search engine within the site to find the Deepwater Horizon Oil Spill photos. OR&R Photos for Incident News for the Deepwater Horizon Spill: Contains daily situation report updates from the OR&R scientists advising the Coast Guard as well as an array of overflight photos. NOAA Gulf Spill Restoration: This website serves as the central source of information on the Deepwater Horizon oil spill restoration. Several projects have already begun to compensate the public for these environmental injuries of the Gulf’s coastal waters, lands, plants, and animals. On this website, you may submit ideas for restoration projects, see ideas submitted by others, and keep up-to-date on restoration project planning and implementation.